Marieke (1.67m, E cup) wears a size S.
New exclusive collection from Emmy! 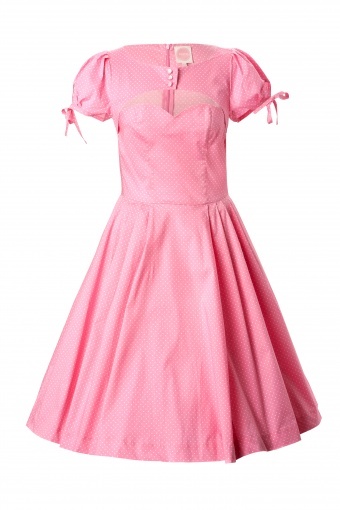 The 50s Swirlie Sweetheart Dress in Pink Dots. 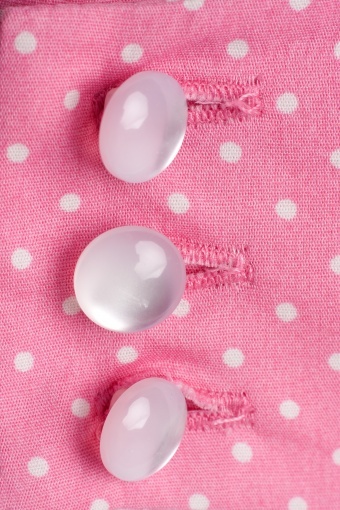 Be bare and dressed at the same time in this girly number! The dress has a buttoned yoke that lookes like a bolero jacket from the front but the dress has a whole back. It shows just enough of your decoltage without being too revealing. The boatnecked dress has short puffy sleeves with adjustable ribbons to tie around your arms and a pleated full skirt that is flat at the front. Just like most dresses in our summer collection, it has practical pockets hidden behind the pleats in the sides. This allows you too swing around on the dance floor without risking loosing your belongings or accidently hit someone in the face with your purse. For an extra festive look – match it up with our petticoats as shown on the pics! Also available in Cherry Pink!